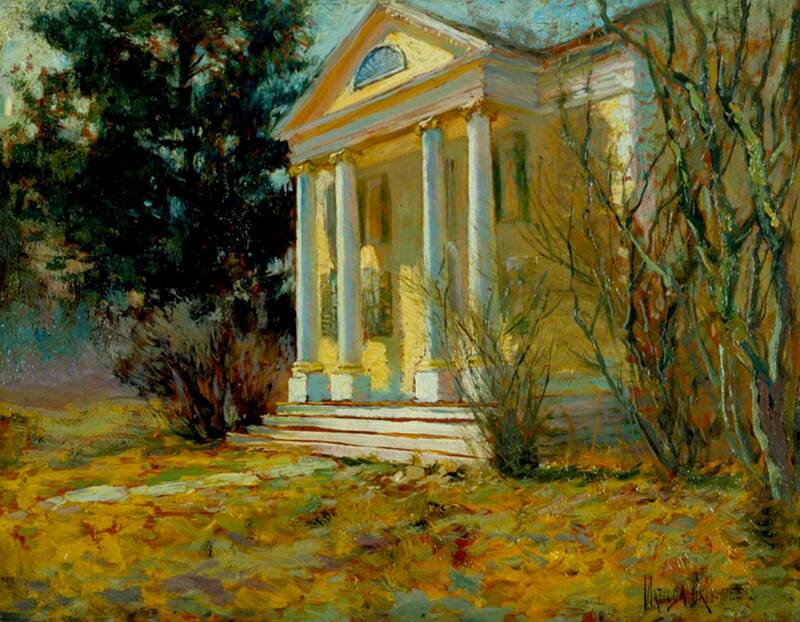 This online exhibition was created in conjunction with the exhibition, The Art of First Lady Ellen Axson Wilson: American Impressionist, on view at the Florence Griswold Museum October 5, 2012 - January 27, 2013. 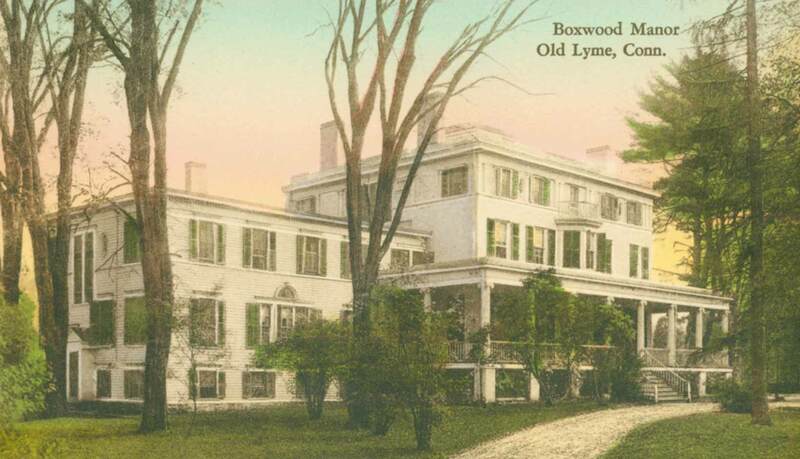 This exhibition is designed to enrich the Museum’s educational offerings related to Woodrow and Ellen Axson Wilson, as well as their young family’s role in Old Lyme at the Griswold Boardinghouse as part of the Lyme Art Colony. 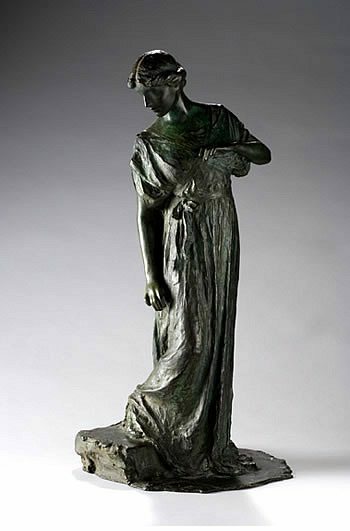 The exhibition was made possible through a grant from Connecticut Humanities. ca. 1910-20 lithograph on paper. Woodrow Wilson House, a National Trust Historic Site, Washington, DC. 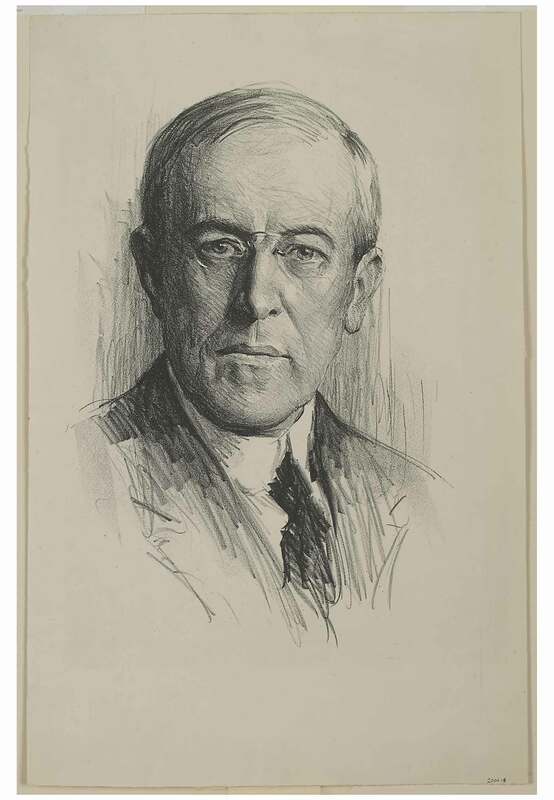 Woodrow Wilson (1856-1924), then President of Princeton University, spent the summer of 1910 at the Griswold House in the company of “a jolly, irresponsible lot of artists, natives of Bohemia, who have about them the air of the broad free world.”  It was a place of familiarity and pleasure for Wilson and, especially, his wife, the artist Ellen Axson Wilson (1860-1914), who wanted to paint in the company of the Lyme artists and enjoy a respite from the social demands of their life at Princeton. Throughout that June and July of 1910, Woodrow was considering whether to accept the Democratic nomination for the governorship of New Jersey. The decision was a weighty one because New Jersey was, as Wilson put it, the “mere preliminary”  for a larger plan. 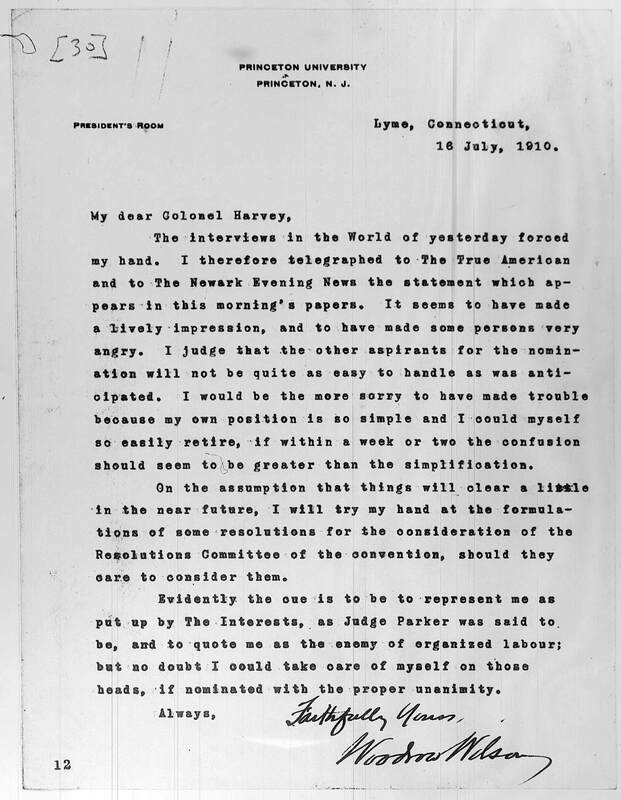 Woodrow Wilson to Mary Peck, June 19, 1909, Link et al, eds., The Papers of Woodrow Wilson, 19:262 (hereafter cited as PWW). 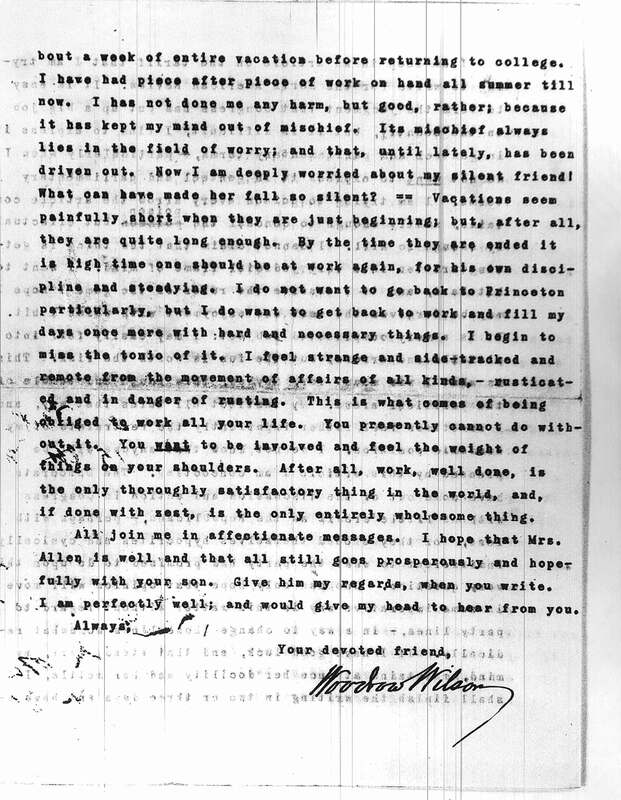 Woodrow Wilson to David Benton Jones, June 27, 1910, Ibid. 20:543. Wilson had just gone through a grueling controversy at Princeton over the location of a residential graduate college that had divided the trustees, faculty, and alumni. Represented in the press as fundamentally “a contest between the forces of privilege and democracy,” Wilson earned strong allies (and not a few enemies) within Princeton with his forceful position that he was fully dedicated to democratizing American universities (see PWW, 20: vii). As he considered this “most unusual” opportunity, he was torn by his allegiances to Princeton and his realization that the educational reforms that he had put in place there were unfinished (see PWW, 20: 543). Letters, telegrams, and phone calls came daily to the Griswold House, “care of Miss Florence Griswold, Lyme, Conn.” The excitement in the household was considerable. In early July, when news of this possibility was leaked to the press, reporters showed up to interview Dr. Wilson after a round of golf. The reporter noted that he was “collarless and perspiring and his face was bronzed.” He greeted the reporter with a smile, which darkened into a frown, however, when the subject of politics was broached. ‘I don’t want to talk politics at all,’ said Dr. Wilson, when first asked as to his possible candidacy for Governor.”  Within a week, however, Wilson decided he would accept the nomination on the condition that it was desired by a “decided majority of thoughtful Democrats of the State” and that it was clear he had not in any way campaigned for the office. If those conditions were met, he did not see how he could forego practicing what he had long preached in his classes – the duty of public service when called upon. On July 16, 1910, Wilson released a statement to the press from the Florence Griswold House, signaling the beginning of his entry into politics. In little over two years, Woodrow Wilson would rise to its highest office, becoming the 28th President of the United States. “Dr. Wilson Not Seeking Office,” Printed in the Newark Evening News, July 9, 1910, from PWW, 20: 568. Nominated on September 15th, Wilson gave a rousing acceptance speech. 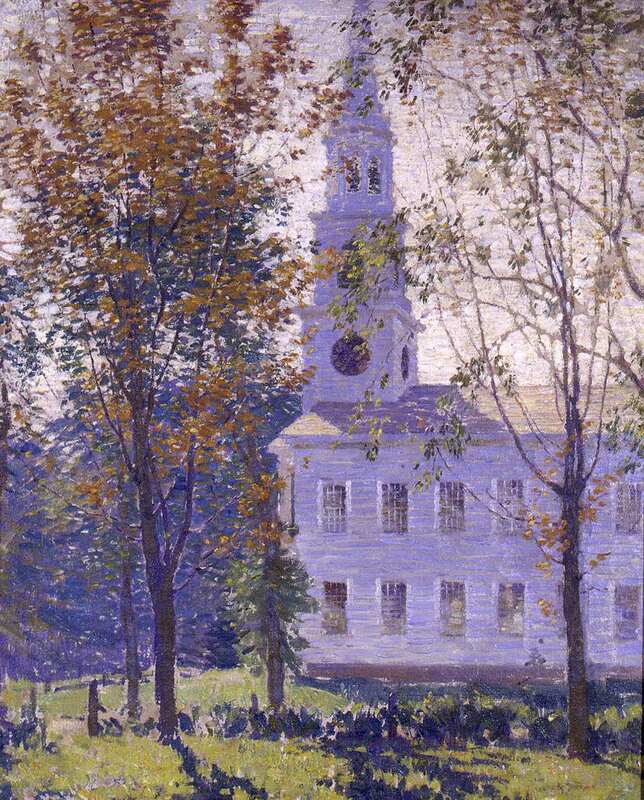 Still in Old Lyme, Ellen sent a telegram: “Congratulations from all the household love from the family.”PWW, 21:101. 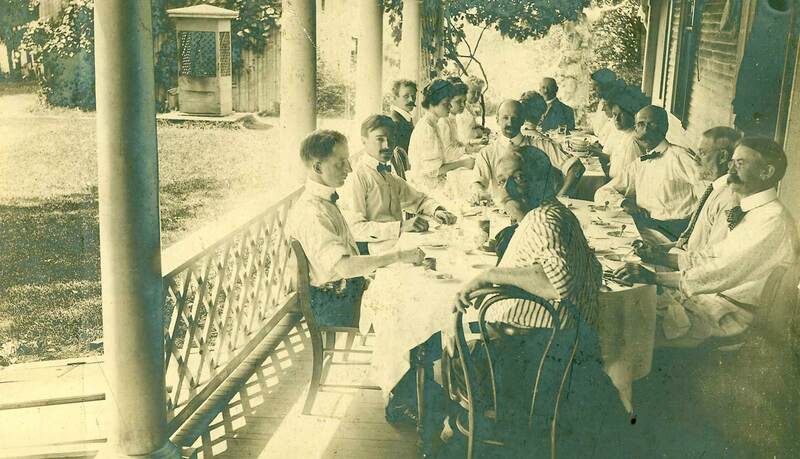 The Wilsons’ first stay in Old Lyme – the summer of 1905 – was prompted by personal tragedy. That spring Ellen’s younger brother Edward Axson (1876-1905) and his young family had all drowned in a boating accident.Ellen was devastated. Feeling that a change of scenery would be restorative for her, and at the suggestion of Princeton Professor Williamson Vreeland, the Wilsons made plans to spend the summer in Old Lyme. 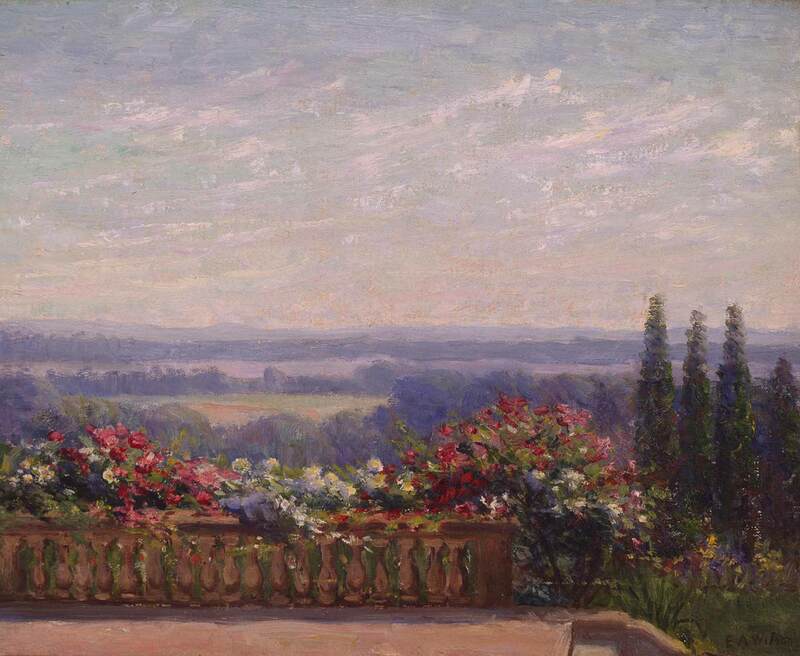 The Vreelands had a summer place on Lord Hill in Lyme and they felt the area would be an ideal place where Ellen could pursue her interest in painting with the artists’ colony. In early July, Wilson traveled to Old Lyme to investigate the possibilities. He stayed at the Old Lyme Inn and made arrangements for the family to take their room and board at Boxwood, then a summer boardinghouse run by Miss Thibits, and just down the street from the Florence Griswold House. There are two other intriguing personal connections that may have contributed to their decision to go to Old Lyme. 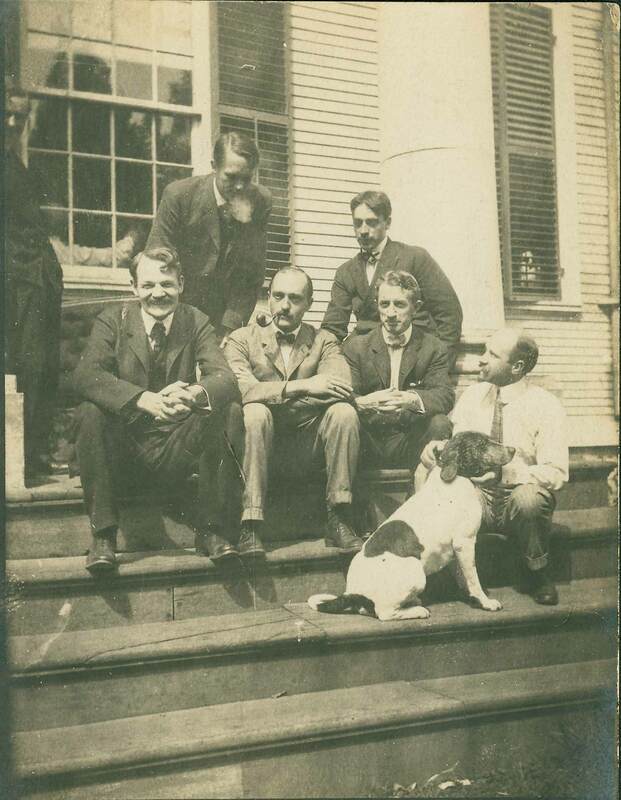 Woodrow Wilson’s assistant at Princeton was a young man by the name of Arthur C. Ludington whose family was one of the most prominent families that summered in Old Lyme. Certainly he would have been a source of information about the town. 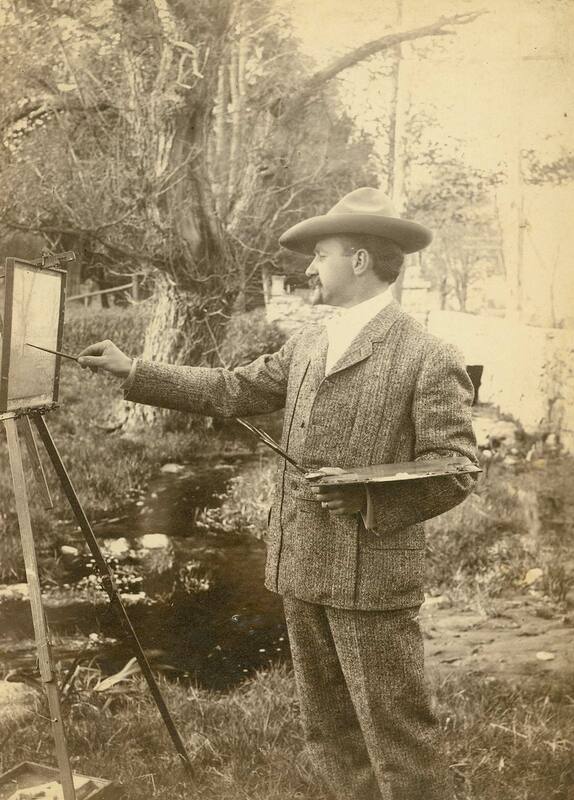 In addition, the Wilsons had commissioned a Richmond Virginia artist by the name of Adele Williams to paint their portraits. 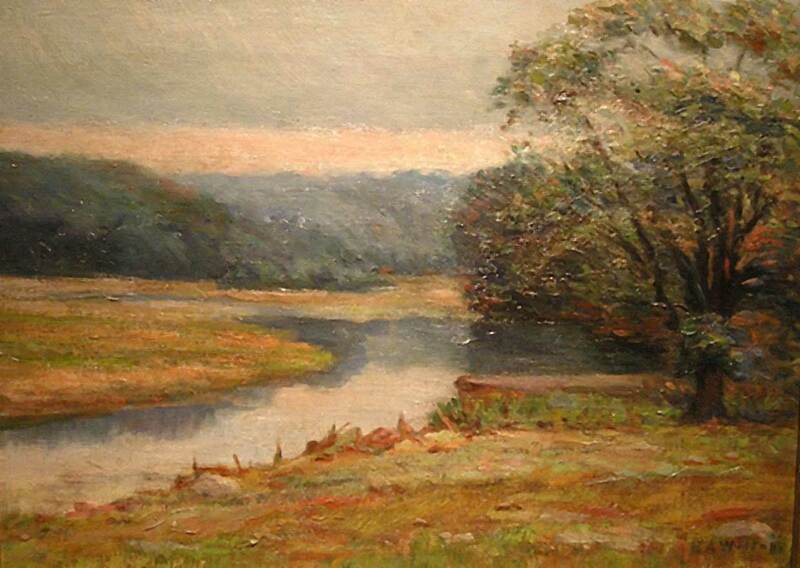 She began working on them in Princeton during the fall of 1903, shortly after she spent the past summer in Old Lyme with the artist colony. She became quite friendly with Ellen Wilson and it seems entirely likely that she spoke with her about her experience that summer. 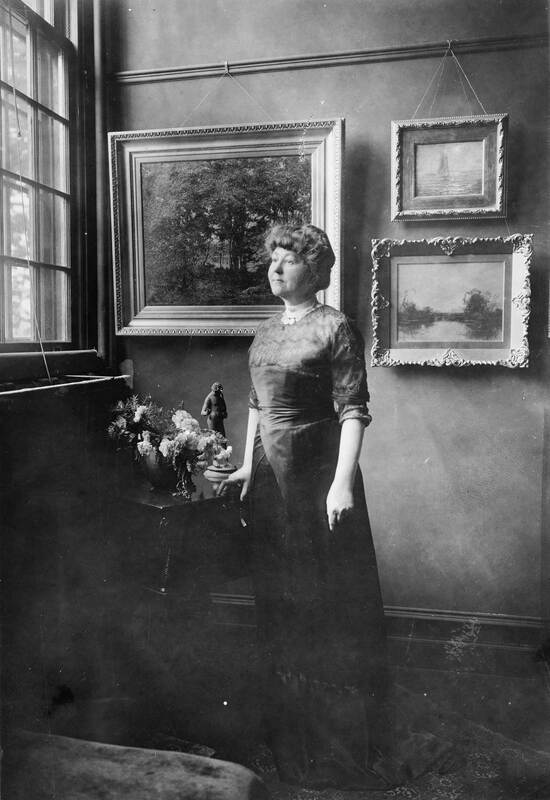 Art had been long been Ellen Axson Wilson’s passion. 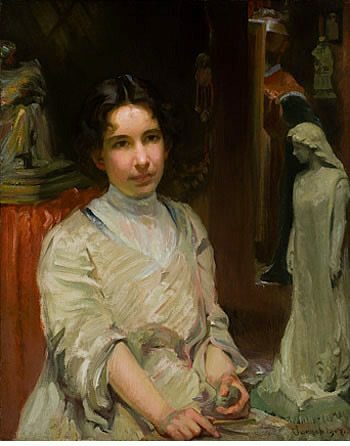 Trained initially at the Rome Female College in her native state of Georgia and then at the Art Students League in New York where she spent a year from 1884 to 1885, Ellen had largely abandoned her career as an artist to raise their three daughters, Margaret, Jessie and Nell. Now that they were teenagers with their own interests, she had begun to seriously work at her art again. She enrolled in the Lyme Summer School of Art, sponsored by the Art Students League. Normally led by the popular teacher and art colony member Frank Vincent DuMond, it was taught by his assistant Will Howe Foote during the summer of 1905. Ellen enrolled in daily classes and twice weekly critiques for a period of five weeks. According to Ellen’s biographer Frances Saunders, “Woodrow’s plan to surround Ellen with artists proved wise. 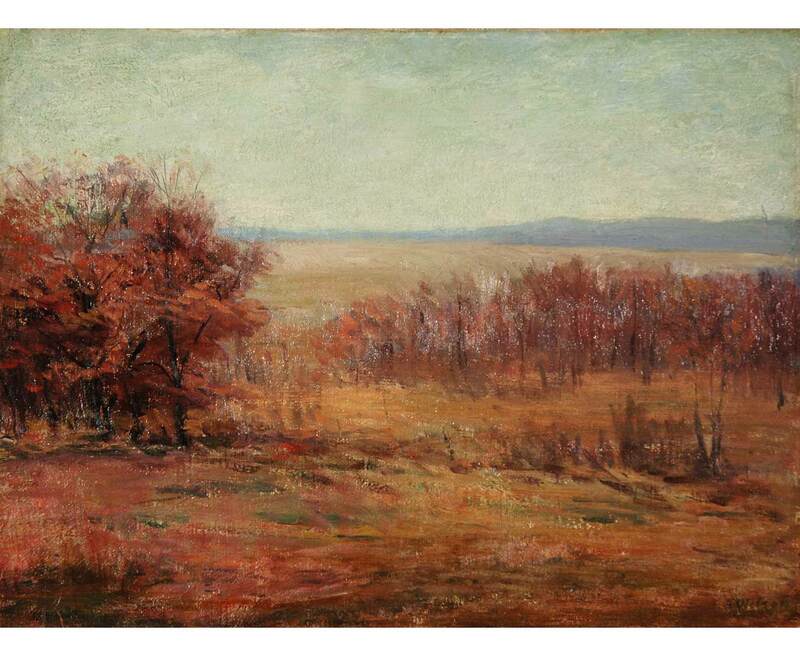 She began to enjoy painting landscapes in oil, and, in due course, this would supplant her former work in portraiture.”  With “spirits vastly improved,” she left Old Lyme in mid-September and returned to Princeton. 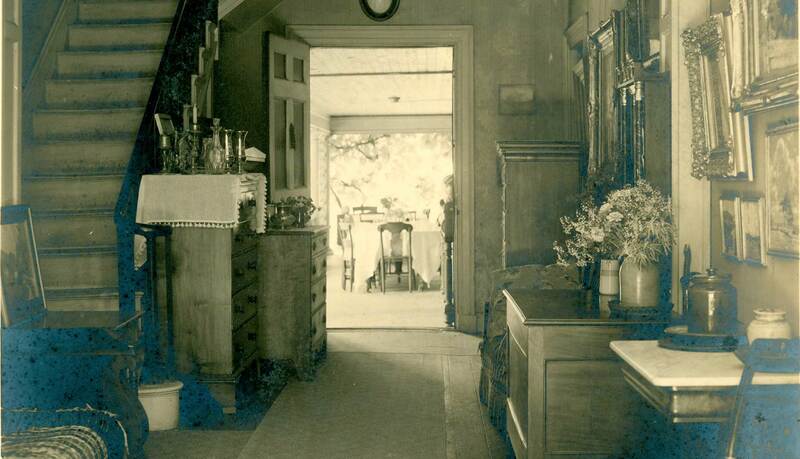 During the spring of 1908, Ellen made plans to return to Old Lyme. On June 22nd, she arrived at Miss Florence’s with her three daughters and her sister Margaret “Madge” Axson. Woodrow went abroad that summer to the Lake District of England, a region he had greatly enjoyed on previous occasions. 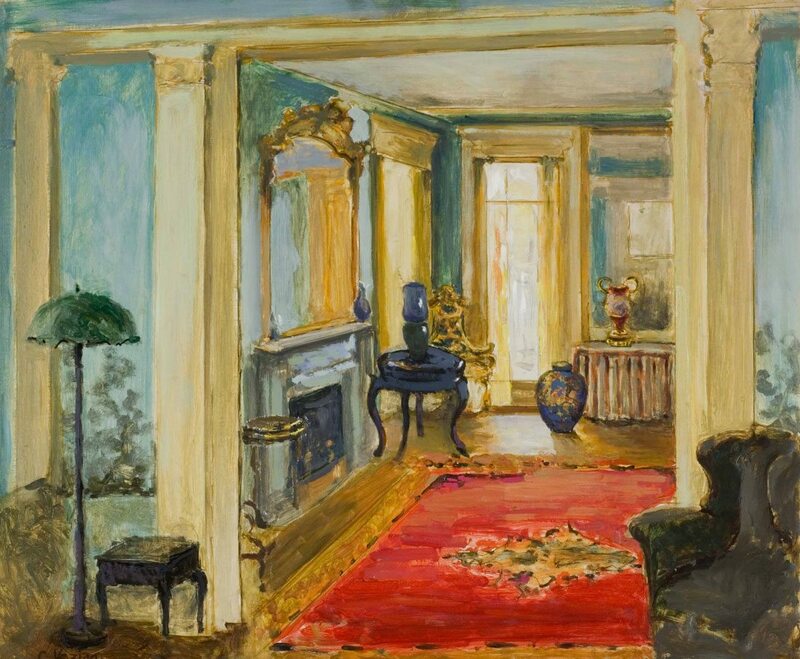 Staying in a series of rooms on the second floor of the Griswold House, Ellen threw herself into her painting and found DuMond an encouraging teacher who saw progress in her own work. He arranged for Ellen to have her own studio, an unusual accommodation for an art student in Lyme. 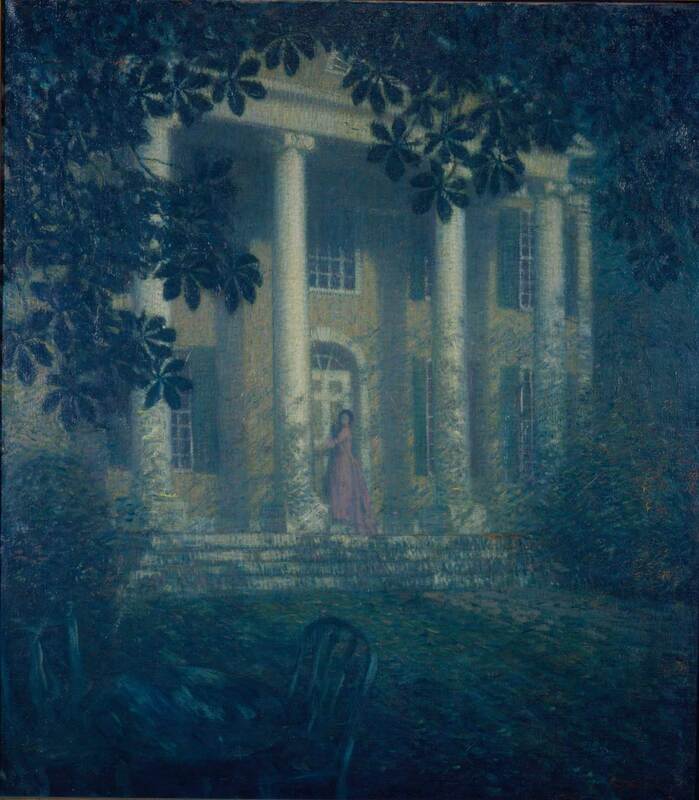 Ellen Axson Wilson’s career as an artist was the subject of a 1993 exhibition held at the Woodrow Wilson House in Washington, D.C. and the Woodrow Wilson Birthplace and Museum in Staunton, Virginia. See Frank J. Aucella, Patricia Hobbs and Frances Wright Saunders, Ellen Axson Wilson First Lady – Artist. Washington, D.C.: Woodrow Wilson House, 1993. For an excellent and authoritative biography on Mrs. Wilson, see Frances Wright Saunders, Ellen Axson Wilson: First Lady Between Two Worlds. Chapel Hill: The University of North Carolina Press, 1985. The Wilson family spent the summer of 1906 abroad in England and the summer of 1907 in the Adirondacks. A few years later, Robert Vonnoh, Bessie’s husband and a respected painter also associated with the Lyme colony, would paint a large figurative oil of Ellen and her three daughters while they summered in Cornish, New Hampshire. 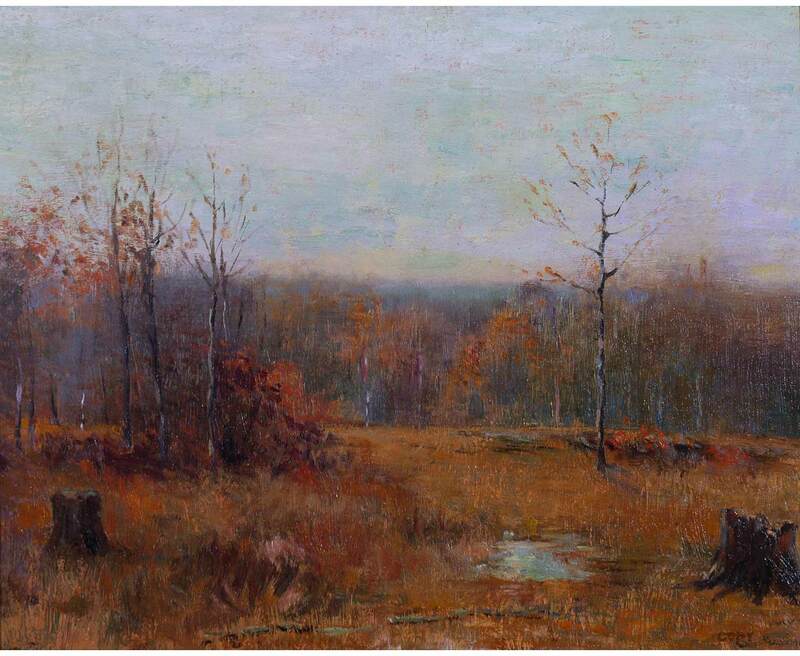 Ellen particularly admired the work of Willard Metcalf, whose landscapes had brought such renown to Old Lyme. What the artists thought of her work is less clear. In her letters, Ellen reported many positive comments. 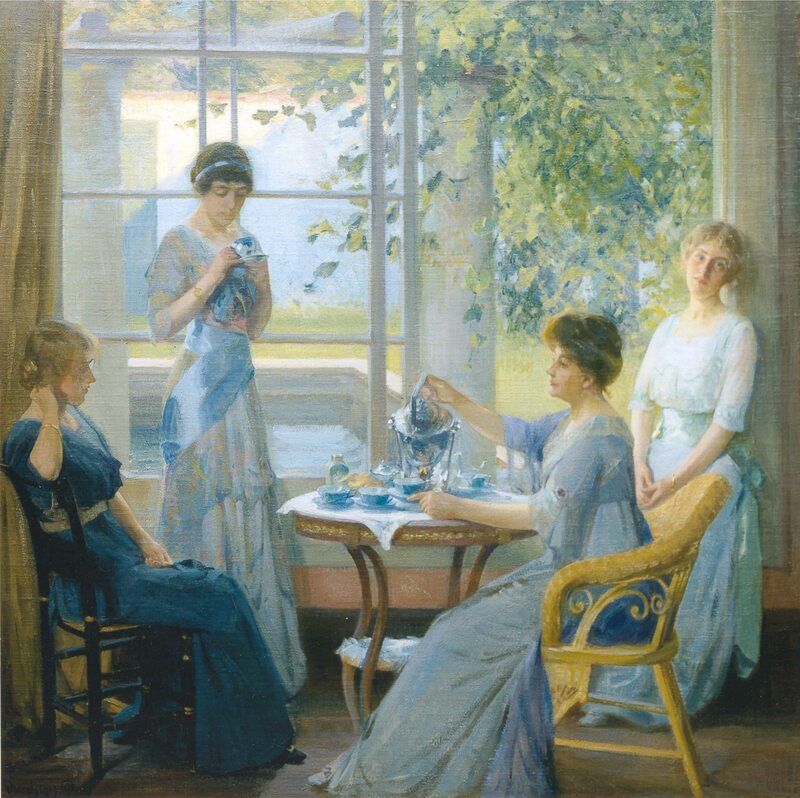 But William Chadwick remarked “although Mrs. Wilson thought that she painted well, she was not really good.”  Within the colony, the distinction between the art student, no matter how dedicated, and the professional artist, who relied on his or her work for a livelihood, was sharply drawn. What the artists thought of her work is less clear. In her letters, Ellen reported many positive comments. 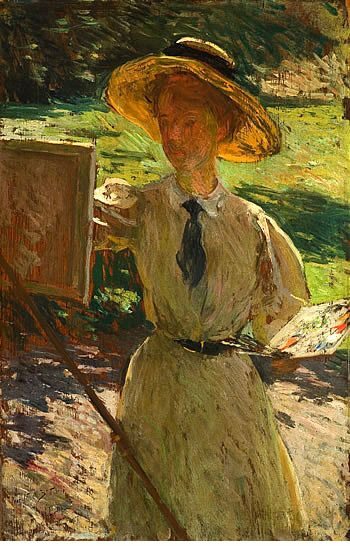 But William Chadwick remarked “although Mrs. Wilson thought that she painted well, she was not really good.” Within the colony, the distinction between the art student, no matter how dedicated, and the professional artist, who relied on his or her work for a livelihood, was sharply drawn. 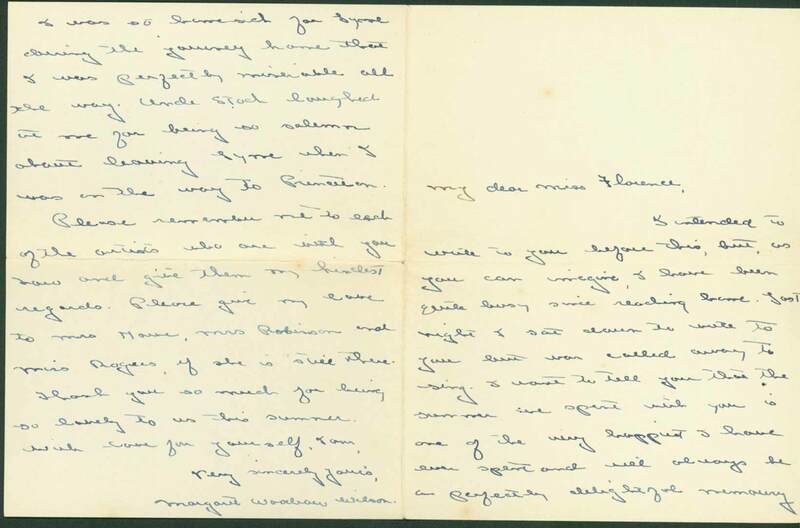 Margaret Woodrow Wilson to Florence Griswold, September 14, 1908, Florence Griswold Papers, Florence Griswold Museum. Frances Wright Saunders, Ellen Axson Wilson: First Lady Between Two Worlds. Chapel Hill: The University of North Carolina Press, 1985, p. 195. 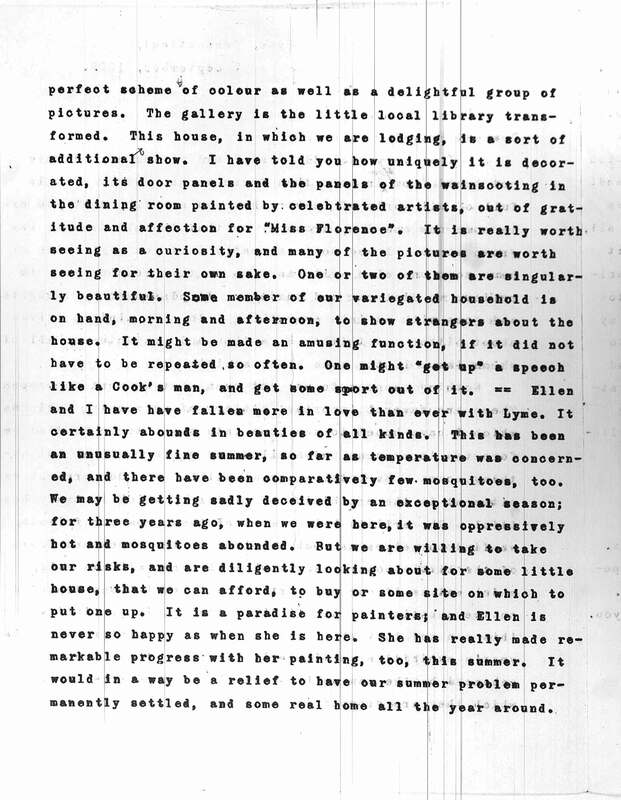 Interview with William Chadwick, “Notes on Painters at Miss Florence Griswold’s,” Summer 1954, p. 2. FGM Archives. Chadwick’s judgment seems harsh today. While some of her oils have a somewhat labored quality, many of her small landscapes interpret the seasonal nuance and mood of her subject with perceptiveness and feeling. 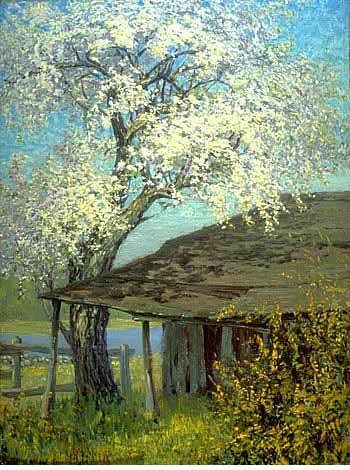 Her art was consistent with prevalent themes within the colony – rural landscapes, river views, nocturnes, apple trees in bloom, and old-fashioned gardens. 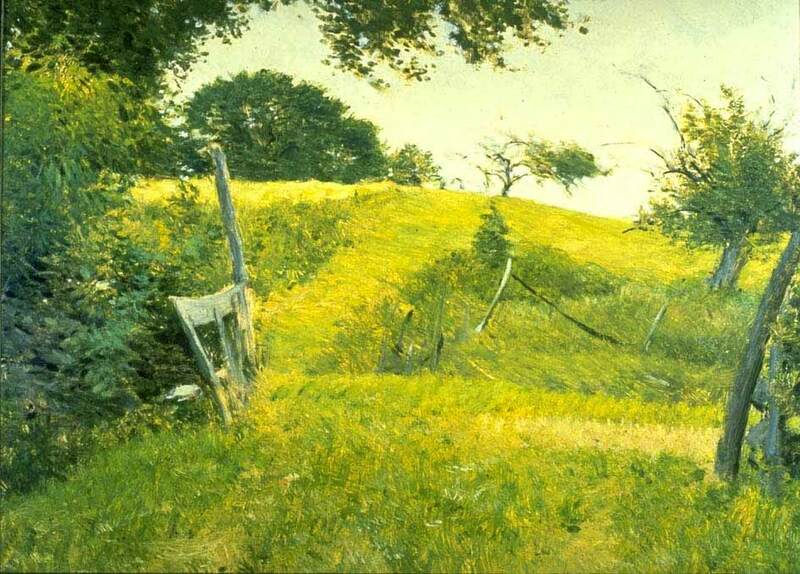 She responded well to DuMond’s advice to simplify and grasp the artistic significance of nature. 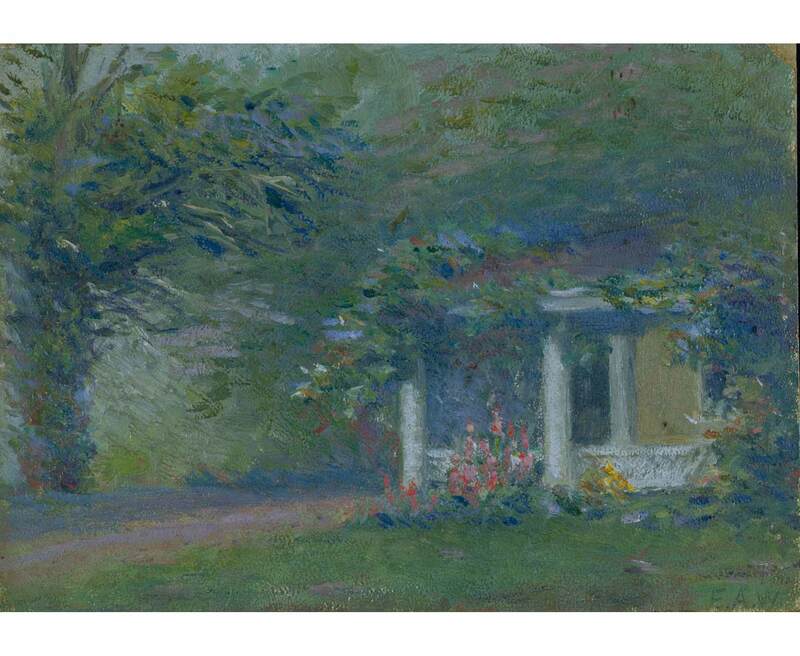 Her oil of “Miss Florence’s Side Porch,” which Florence Griswold owned and treasured as a memento of their friendship, captures the back ell of the Griswold House draped in verdant vines and flowers. 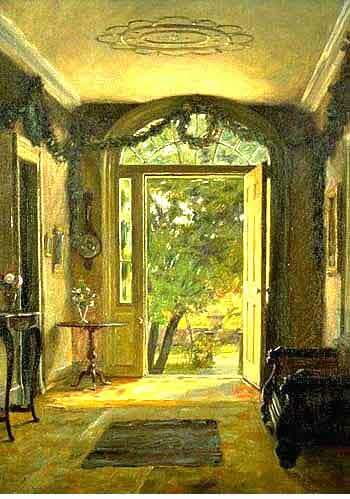 Miss Florence has taken artists (for whom Lyme is headquarters in this part of the world) in to board in her spacious old house out of mind. The place is a perfect artistic curiosity shop, the walls and doors of one room, for example, being painted from end to end with landscapes and figures by men of all stamps, most of them now famous, who have lived there the pleasant, informal life they love and she permits. Woodrow Wilson to Mary Peck, July 11, 1909, PWW, v. 19, p. 308. Dr. Wilson was, of course, given a seat at the men’ table, and it wasn’t long before we not only realized his interest in art, literature and music, but we discovered the he was an excellent storyteller. So good indeed that I have long regretted I did not keep a record of them. And in looking back over the years I remember him as a combination of firmness and tolerance, intellect and godliness; a man of affairs yet a scholar, a thinker, yet a doer. And I thoroughly enjoyed his friendship. No matter what new delicious dishes we offered, Woodrow Wilson always wanted his shredded wheat. So one Sunday morning when it was my turn to wait on table, I selected a nice little bunch of excelsior from a newly arrived packing case, put it in a bowl, poured cream over it, and served it to the future President of the United States. But he didn’t detect until he tried to force it apart with his spoon. "They are very easy to make friends with, and I hope I am." Wilson saw Lyme as a place far removed from the fast-paced world – an enclave that appealed to his scholarly, reflective nature. I find the make-up of the household here a good deal altered. People come and go. You no sooner get interested in them than they are off. It is always the interesting ones that go. The others, to whom you never give a thought and who serve as a sort of filling, are fixed and stationery, as are their counterparts in nature. Woodrow Wilson to Mary Peck, July 18, 1909, Ibid., p. 312. 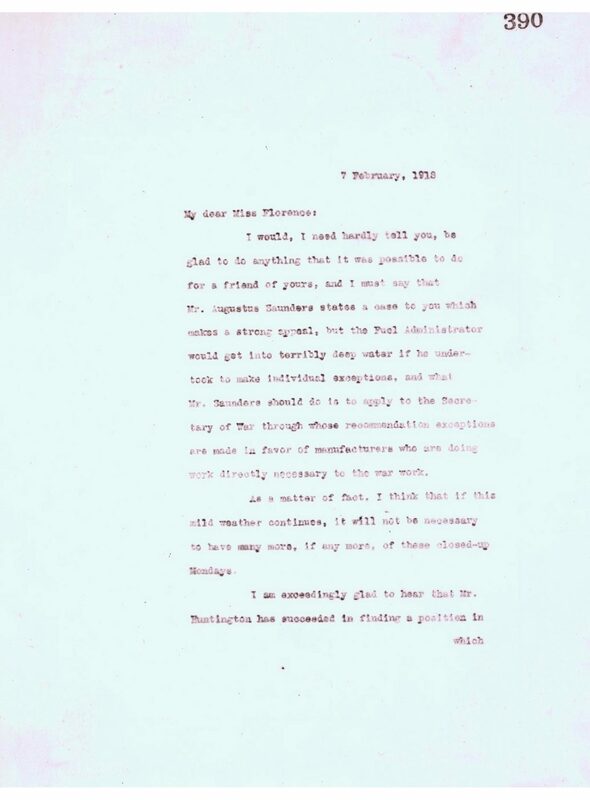 Woodrow Wilson to Mary Peck, August 14, 1909. PWW 19: 333. 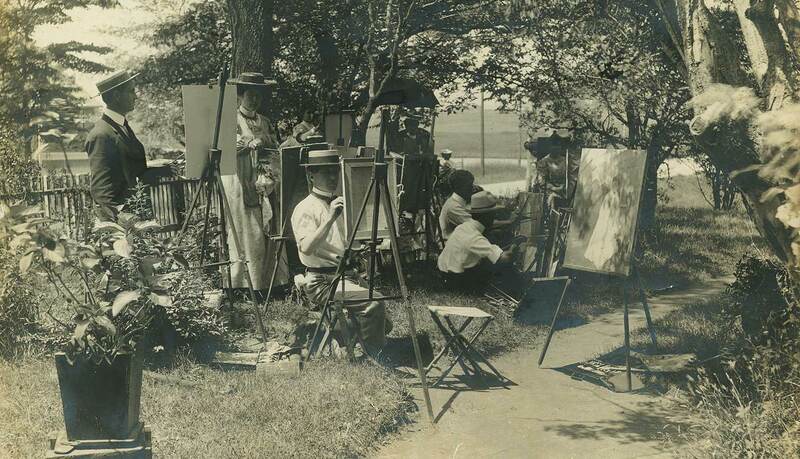 Arthur Heming, Miss Florence and the Artists of Old Lyme. Essex: Pequot Press, 1971, p. 25. Woodrow Wilson to Mary Peck, August 29, 1909, Ibid, p. 355. I sit down with the “hanging committee” at every meal, and hear all the talk of the sensitiveness of this man and the arrogance of that about the place given his picture on the walls of the little library, with its most unsuitable light. The jealousies and personalities of another profession, from which I myself stand entirely detached, are displayed before me in all their detail, in all their consequences. I do not mean that the men display more ill nature than others or that they speak with conscious and intentional unkindness of their fellow artists; but of course I know what men mean when they talk; I can read between the lines very plainly. And because I am not part of it or in it, it seems to me that these fellows live in a rather petty world, — much more petty than the world I live in (there’s where the poison of self-appreciation finds entrance), a very small province of the great kingdom of life; and I feel the condescension of an outsider, who is touched by none of these things! 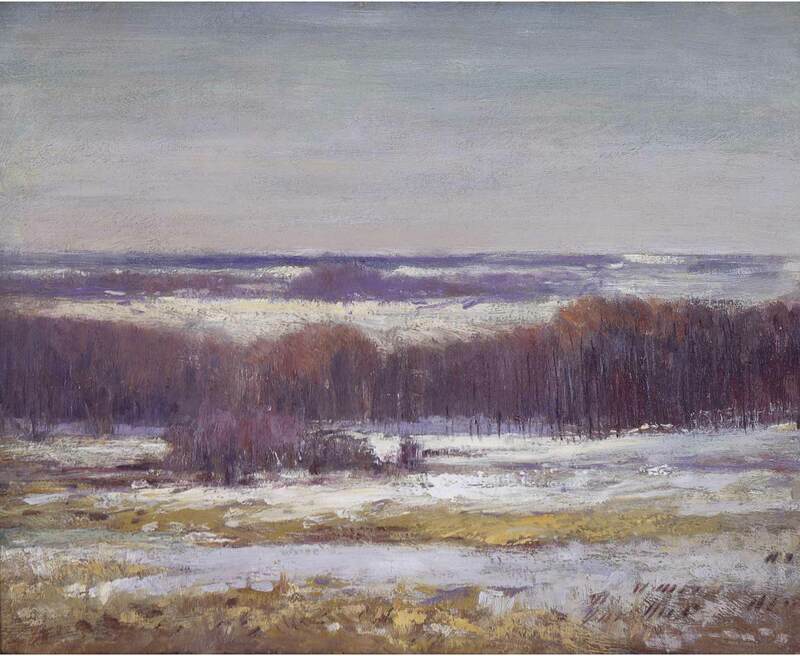 Like many of the artists, Woodrow and Ellen longed for a place in the country. Their happy experience in Old Lyme led them to think seriously about buying a place there. “Ellen and I have fallen more in love than ever with Lyme,” Wilson enthused. “It certainly abounds in beauties of all kinds.”  Living at Princeton in the President’s residence meant they didn’t have a residence truly their own and so, late that summer of 1909, the Wilsons began “diligently looking about for some little house, that we can afford, to buy or some site on which to put one up.”  They eventually found a piece of property on the west side of the Lieutenant River that was owned by David P. Huntley. Everything was settled between purchaser and seller, but Huntley’s difficulties in clearing the title to the property prevented the final closing. Despite this setback, Old Lyme continued to be an important chapter in the Wilsons’ family life over the next few years. In May 1911, Ellen Wilson returned to Old Lyme by herself. Writing ahead to Florence Griswold, she exclaimed: “I should love to get in two weeks of sketching at that charming season.”  Comfortable among both old and new friends at the Griswold House, Ellen turned to painting “apple-blossom subjects” with the other artists in residence, an exercise that she reported in a letter to her husband that left “everybody swearing over them and declaring them impossible.”  Her daughters and the Smith sisters joined her in June, all of them in rooms at Miss Florence’s, where, by all reports, they thoroughly enjoyed the Holy House’s diversions and informal life. The artists especially regarded the daughters as good sports. Woodrow Wilson came up twice during the month of June for brief visits and then, in mid-July, the entire group left for Sea Girt, New Jersey. Woodrow Wilson to Mary Peck, September 5, 1909, Ibid, p. 357. For an interesting perspective on the Wilson family in Old Lyme, see Margaret Axson Elliott, My Aunt Louisa and Woodrow Wilson. Chapel Hill: The University of North Carolina Press, 1944. My thanks to Liz Farrow for bringing this to my attention. The only exception to this was Margaret Wilson’s habit of practicing her scales at Flying Point on the Liuetenant River. According to Will Howe Foote, “this greatly annoyed the artists who were painting the laurel” there. 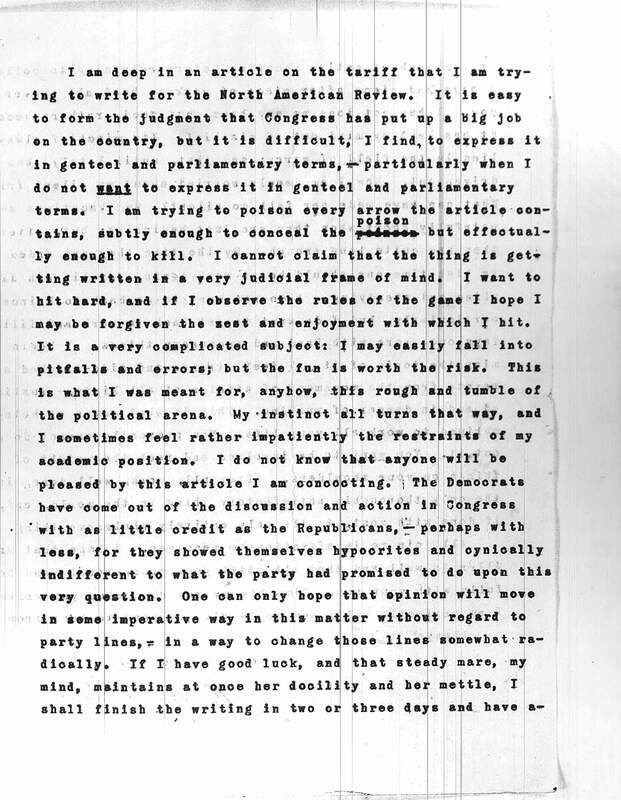 See Notes from Conversation with Will Howe Foote, September 1954, p. 3. Lyme Art Colony Papers, FGM Archives. 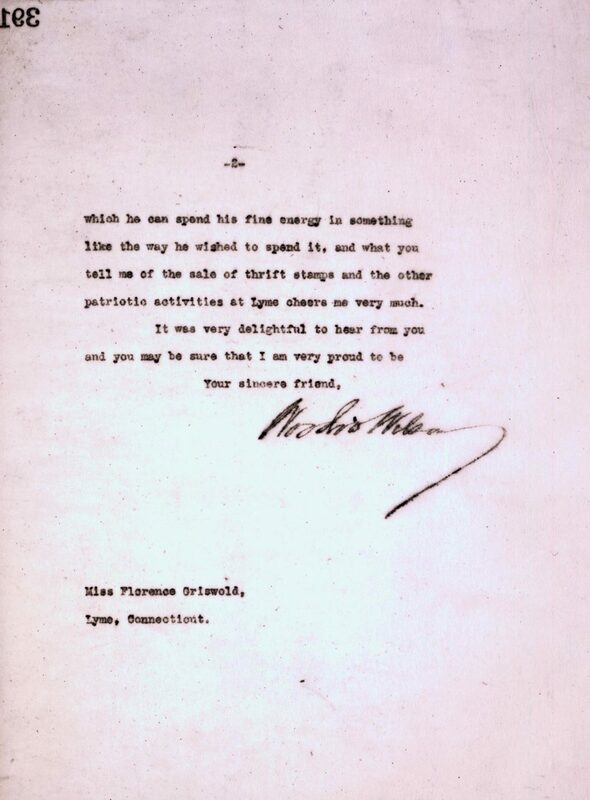 Woodrow Wilson to Florence Griswold, September 10, 1913, Copy in Florence Griswold Papers. FGM. Notes on the Florence Griswold House by Gregory Smith, p. 7. Lyme Art Colony Papers, FGM. The relationship between the Wilsons and Florence Griswold remained one of her most cherished friendships. “I can’t bear to think that the Wilsons will not be here,” she wrote to Ellen in 1912, in recognition that the Governor’s campaign schedule probably wouldn’t permit a visit to Old Lyme. 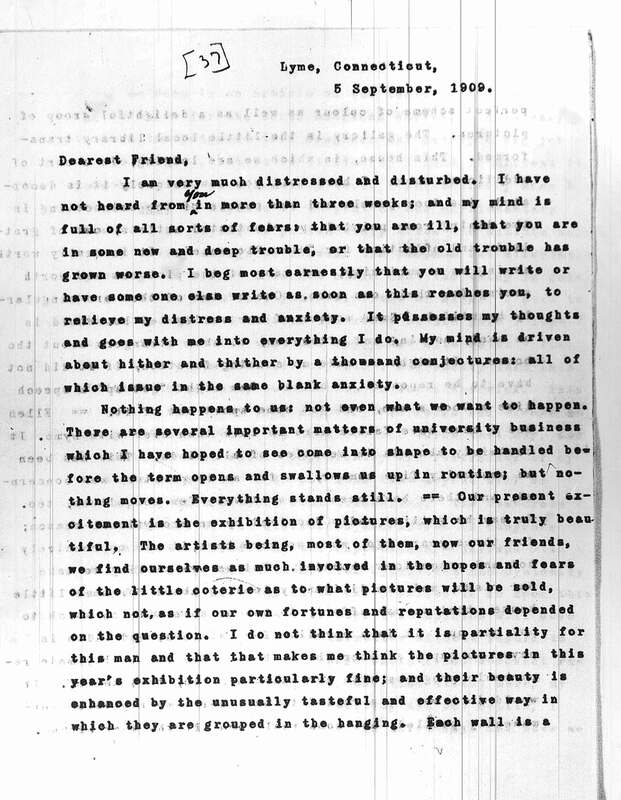 Even after Ellen died prematurely on August 6, 1914 in the White House, Florence Griswold maintained contact with President Wilson, frequently writing to him on largely local subjects (and often requesting that he intervene on her and the town’s behalf) that had little to do with his responsibilities as President. Nevertheless he responded patiently and with obvious fondness for her. After Woodrow remarried in December 1915, he brought his new wife Edith up to Old Lyme in September 1917 to meet Miss Florence and call upon the Vreelands. The Presidential yacht, the U.S.S. Mayflower, anchored off Saybrook Light at the entrance to the Connecticut River. A tender brought them up the Lieutenant River and they walked through the gardens to the Griswold House. On the way back, Mrs. Wilson was overheard to comment that she did not see how anyone could stand to stay in such an “absolutely dreadful, filthy” place. The charm and informality of the Griswold House that “suits me down to the ground,” as Margaret Wilson once put it, was lost on the new Mrs. Woodrow Wilson. It would, however, not be so easily forgotten by her husband and the rest of his family.